A winter squash medley roasted with a savory, sweet, spicy and smokey seasoning – SO good and a huge hit with my husband! My plan last night was to make pumpkin soup for dinner, but I wanted to test out this recipe, so instead I made a roasted chicken and served this as a side – Tommy did not stop raving. He’s a huge fan of sweet winter squashes, but since I tend to like more savory foods this was the perfect balance. You can use any winter squash, I used half of a small butternut, buttercup and delicata squash. If I used the whole thing I would have used two pans, but I plan on using the rest in another recipe. To peel and cut the squash, check out this EASY tip! This makes enough spice mix for a few recipes, you can store the rest in a ziplock bag to make roasted veggies or baked fries. 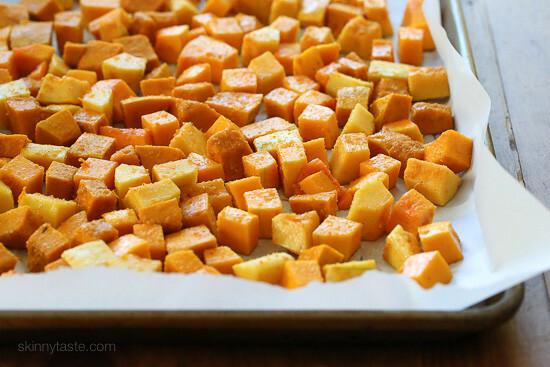 Place squash on a sheet pan lined with parchment and bake for 40-45 minutes, tossing every 15 minutes, to allow for even browning. Sprinkle with 1 1/2 teaspoons more of spice mixture. Toss gently to coat and serve hot. Made this tonight……fabulous! Thank you Gina! Hi. Your spice mix is easier however, i use fresh onion, garlic, and rosemary all very finely minced with smoked paprika, brown sugar, salt & pepper and extra virgin olive oil. I omit the butter.. I cover with foil for half the cooking time tossing every ten minutes. Perfection everytime. When using potatoes or turnips, i omit the sugar. Very good! I made it with preprepared butternut squash to save time. Will definitely make again. I’m working on trying more veggies than the usual. This was the first time I had butternut squash. Oh my goodness, this was delicious and so easy (I bought packaged diced squash). I have a new veggie!!!! Great tip for peeling! Thanks!! We’re trying this today for Thanksgiving! Would this recipe reheat well? I would like to make it ahead of time and take it Thanksgiving Dinner. Hi! I found this recipe via the My Fitness Pal blog and tried it that weekend; I love it so much that I made a second batch later that week and I’ve just gone out and bought another squash! I honestly just use one butternut squash because I’m the only one in my family who likes squash (making it a bit pointless to buy more than one) but it’s just sooo delicious! Thanks so much. I’ve sent this to my mom, as well, who adores squash as much as I do. GINA ! this is sooo good! thank you .. =) this is the first time i have ever had butternut squash.. it looked so good on your recipe.. that i had to try it.. once i tackled that monster veggie with all my kitchen gadgets to peel it.. it went all well.. but yes i do plan to have this more often.. !! thanks again.. But … I’ll peel the squash the ‘normal’ way. I don’t own (and never will own) a microwave! Peeling may be harder the old fashioned way, but I’ll NEVER microwave my food again. I’d like to include this for our Thanksgiving meal this year. Will the texture suffer too much if I make an hour ahead and put in a crockpot on warm? Thank you! Personally what I like about this is the texture and browned edges so I am not sure? Gina, I’m always looking for healthy envelope-type mixes to give as gifts, like taco seasoning mix. Do you think if I put this seasoning mix in jars, it would last for a while? Would it work on all roasted veggies? Thank you. Do you think I could use frozen butternut squash cubes? I have some leftover in the freezer from another recipe I made. I haven’t tried it but it should be fine. Pingback: Healthy Meal Planning: Weekly Dinner Menu #74 [Kitchen Renovation Edition] - Jump, Jive and Kale! Thanks for the recipe! It is easy and delicious! This is amazing! 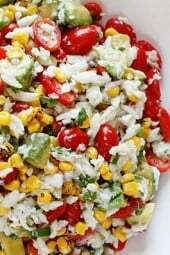 Thank you for the great, easy side dish. I've never roasted a squash (sad to say), but I just loved this so much that I made it twice this week. Thank you again!! How long do you think the spice mixture will last? Also, do you melt the butter & olive oil to the spice mixture? Didn't notice when that gets added. Thanks. Spice mix will last a very long time. No you toss it with the squash. Made this twice and loved it!!! But I'm having trouble getting it to crisp up!! Any suggestions other than leaving it in longer? Can it be sautéed in a pan instead? You can increase the oven temp but it won't be crisp like a french fry if that's what you're thinking? 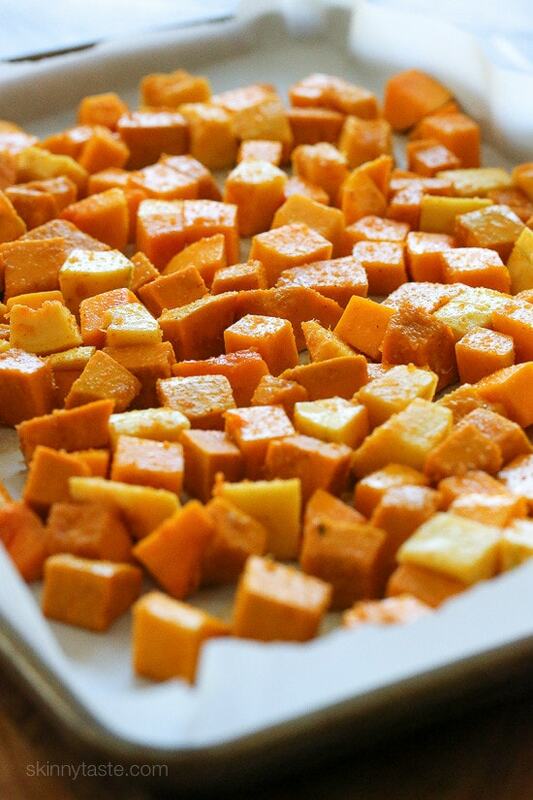 So freakin' delicious….and generally, I don't like eating baked squash. This is going to be a fall staple in my household! I forgot to say, your helpful column on making the cutting and peeling of the squash changed my life. I don't make squash often because it's so hard to cut into — now I can do it easily. Thanks again! I made this this weekend and it was fabulous. I am thinking seriously of adding it to my Thanksgiving lineup. I stupidly did not read the recipe carefully and threw out the leftover seasoning but I won't make that mistake again. Love your blog! This was my first time cooking with squash IN MY LIFE so was a bit nervous but both me and my boyfriend LOVED it! 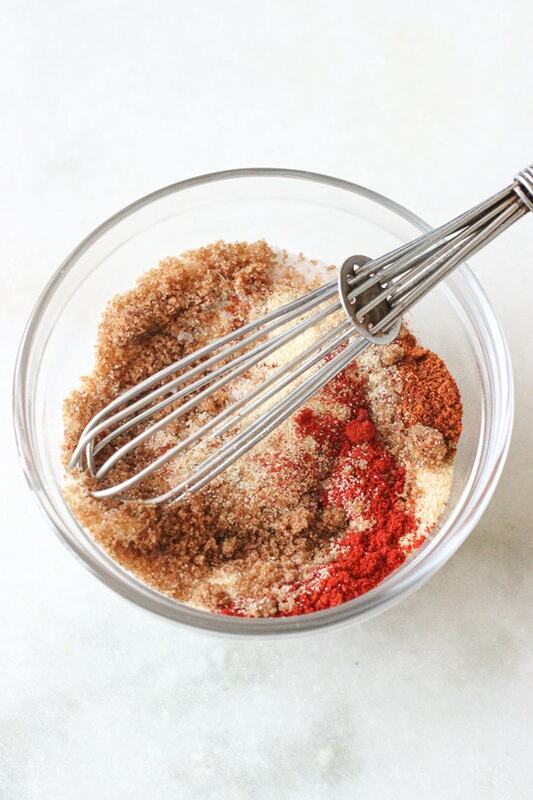 Perfect combination of seasonings. Will definitely be making this again. Thanks! would spaghetti squash work here? I couldn't find anything here in texas, but butternut squash, spaghetti squash, or acorn squash. Would these work? Can you cut spaghetti squash into pieces? No, use butternut and acorn. Spaghetti squash will not work. Thank you, thank you, thank you! I am eating this right now for lunch. I used half an acorn squash that needed used and a small zuchinni and some mushrooms. It is delicious! And a great way to use up yummy veggies that needed used. 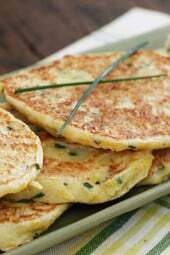 I cooked up an egg to go with it and I have an easy complete meal that taste delicious! And seasoning to use a few more time! I'm so happy! Thanks again! Can you get frozen butternut squash? Would that taste the same? I made this tonight as a side dish with chicken thighs and steamed broccoli.I didn't have chili powder, but used chipotle powder instead. It was delicious. Definitely a keeper. Thought this would be good as a cold salad in the summer. Ready to head to the store for another butternut squash, just to have one on hand.Thanks, Gina. Made this last night and it was AWESOME — though it was already starting to burn when I went to toss at 30minutes so I'd recommend checking it every 10 minutes or so! 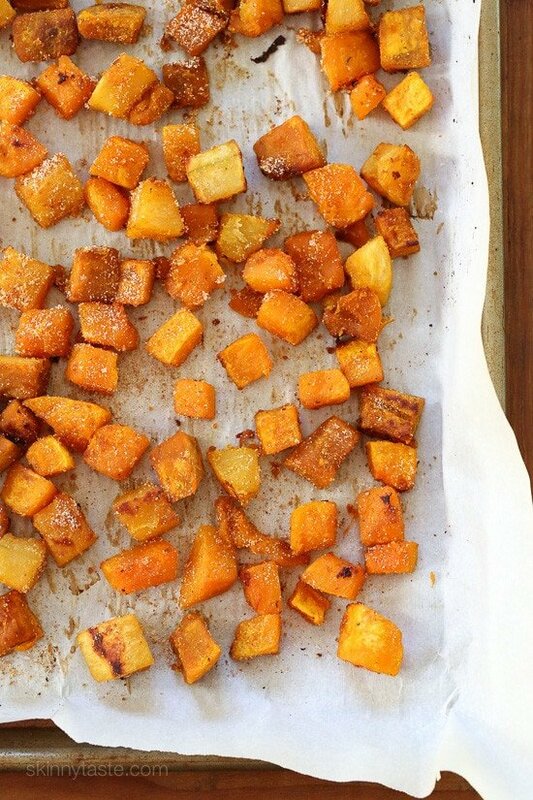 This looks like Fall perfection! Found a good tip on winter squash…pierce squash with knife about 4 -5 slots. Place in microwave for 2 -5 minutes depending on the size. It will peel very easily and will be easy to dice. Just tested this out, it was perfect! I just shared a quick blog post on it, thank you!!! This looks great! 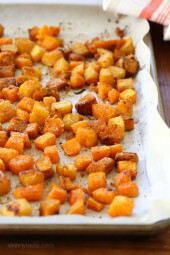 I loved roasted winter squash! Actually, I love any roasted root vegetables. And I am with your husband and like the sweetness with the squash, so I always use either brown sugar or maple syrup. Your spice mix looks like a wonderful change from my usual s & p and thyme. The smoked paprika is especially appealing. I'll probably either leave out the butter or halve both the butter and oil, spray the pan, to lower the fat content. 6.5 g is too much for me in a side dish, but I'm used to having to cook that way. It just takes a little more watching in the oven! Can't wait to try it! Enjoy! You could certainly use less if you wish, perhaps some spray in a mister would help. Good question, I was wondering the same thing. Would be nice to get an answer on this one! If you put all the ingredients into recipe builder, you will get 4 points. It's more because anytime you cook veggies with oil or other ingredients they become "points", Something to do with the way we metabolize raw vs cooked or roasted. Yes, it's a bit crisp on the outside, tender on the inside. Pretty addicting honestly, I kept going back for more. This reminds me of an Ina Garten recipe I have been making for years. I love the addition of the savory spices. 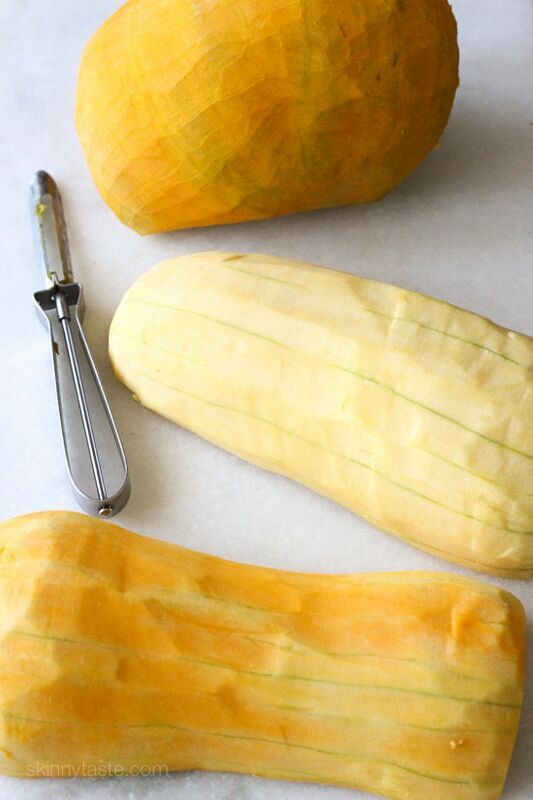 This may be a silly question, but how do you cut your squash? Any time I have tried, I almost feel like my knife &/or my hand will break. Poke the squash with a fork then microwave for a minute or two depending on size of squash. It softens the skin enough to make fitting safer. The ER nurse gave me that tip when I had an unfortunate incident with a spaghetti squash. Thank you for that tip! I'm always so worried about having that kind of incident! 🙂 Plus, I have RA, so this will make it easier on the wrists. Love that tip, thanks for sharing! I was going to ask the same Question, I have no idea how to cut a squash….I'm trying to eat healthier, so I am new to all these veggies…wasn't quite sure how to cut a squash. Recipe sounds good, if I can get the squash cut, I'm gonna try this! Thanks!! Yummmm! Such a small amount of sugar will help caramelize the squash. Can't wait to try. My market even has pre-cut squash to make it very simple. Even better, although be sure to cut it smaller after. I was JUST looking for something like this. Talk about perfect timing!! Great, if you make it please come back and leave a comment! I love roasted squash. Love the spices in this with the smoky sweet combo. Delicious! Would this be good with regular potatoes too? Not sure if you mean these spices on regular potatoes or adding regular potatoes to this. Either way, I think it would work pretty well, but if you are using only potatoes, I would omit the sugar. This would be great over sweet potato fries! I do almost the same thing with sweet potatoes! Great! I wanted to try it with sweet potatoes instead. Would acorn squash be considered a winter squash? Yes, I believe that any of the hard skinned squash as "winter" squash. Do you think this would still work if I omit the sugar? I'm doing whole30 right now and all sweeteners are out. I prefer my squash savory too! 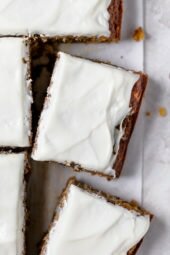 I make this all the time and have never added Sugar!